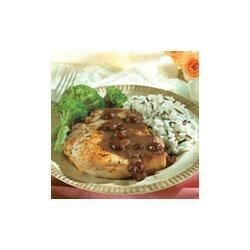 "Seasoned pork chops are cooked just until tender, and served with a tangy dried cranberry and vinegar sauce made special with Swanson® Chicken Stock." Season the pork with the lemon pepper. Cook the pork in a 10-inch nonstick skillet over medium heat for 20 minutes or until it's well browned on both sides and cooked through. Remove the pork from the skillet and keep warm. Heat 1 tablespoon butter in the skillet. Add the garlic and cook until it's tender. Stir the stock, vinegar and cranberries in the skillet and heat to a boil. Cook for 10 minutes or until the sauce is slightly thickened. Stir in the remaining butter. Serve the pork with the sauce. This festive pork dish uses Swanson® Unsalted Chicken Stock. This had a wonderful flavor and the pork chops were very tender BUT I followed the recipe to the tee and still the sauce came out really thin. Is there a trick to making it thicken? I gave this 3 stars for the sauce. I will try this with pork tenderloin next time. The 20min cooking time was way too long for the pork chops. They were very dry.